Good morning ! 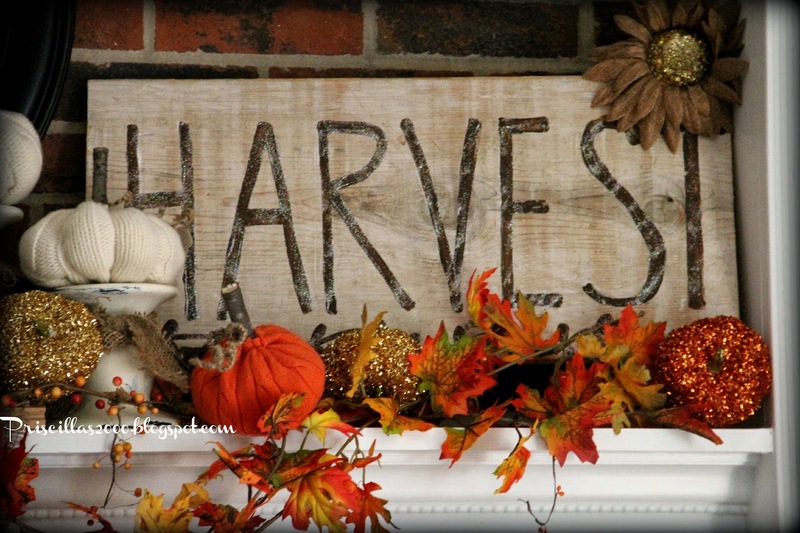 Hope you come in and see all the Fall decor ! 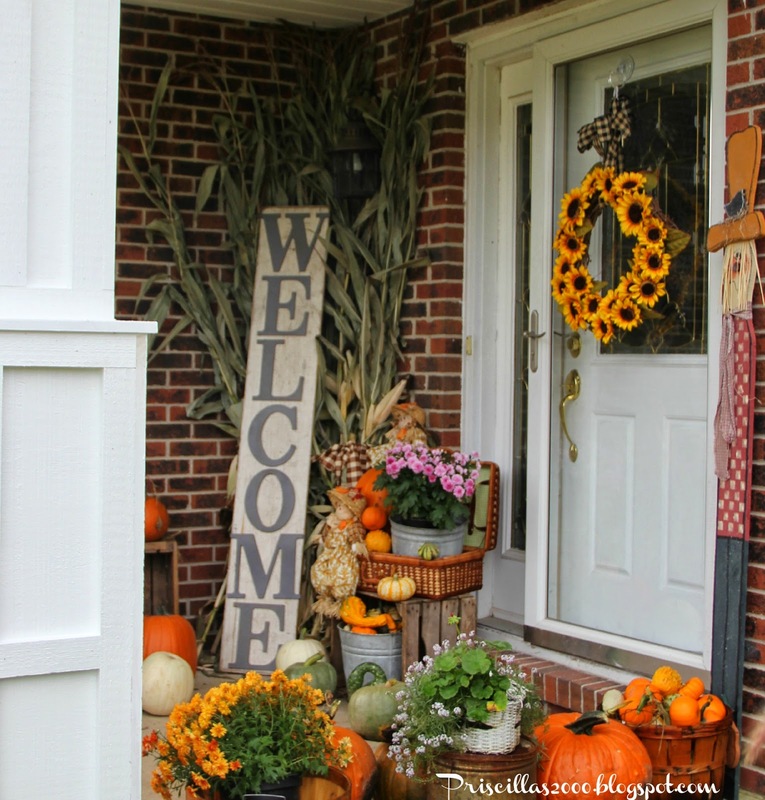 Surrounding our planting beds in the front of the house are 108 pumpkins ..
Our Fall porch has a DIY welcome sign , DIY sunflower wreath , mums ,galvanized buckets of gourds ,wicker picnic basket and more pumpkins ! 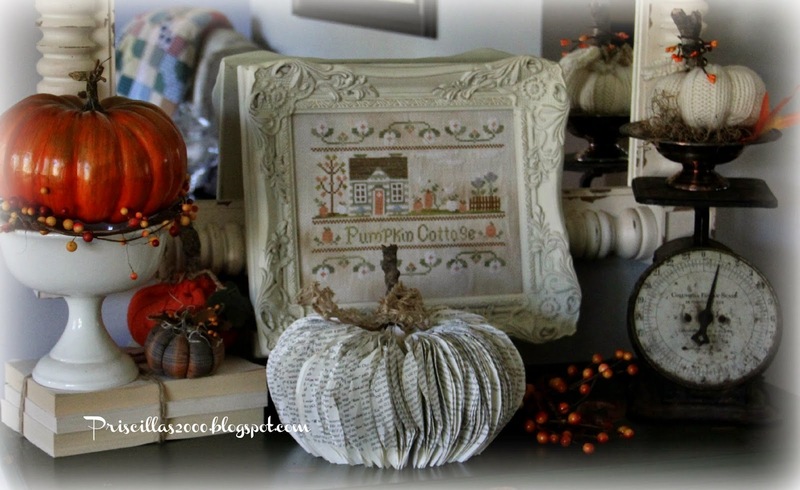 In the foyer the stairs are draped with burlap and fall leaves and berries ..Hanging on the mirror is a cofee filter wreath..On the chest is a bookpage pumpkin , Pumpkin cottage by Country Cottage Needleworks,a vintage scale and some sweater pumpkins .. 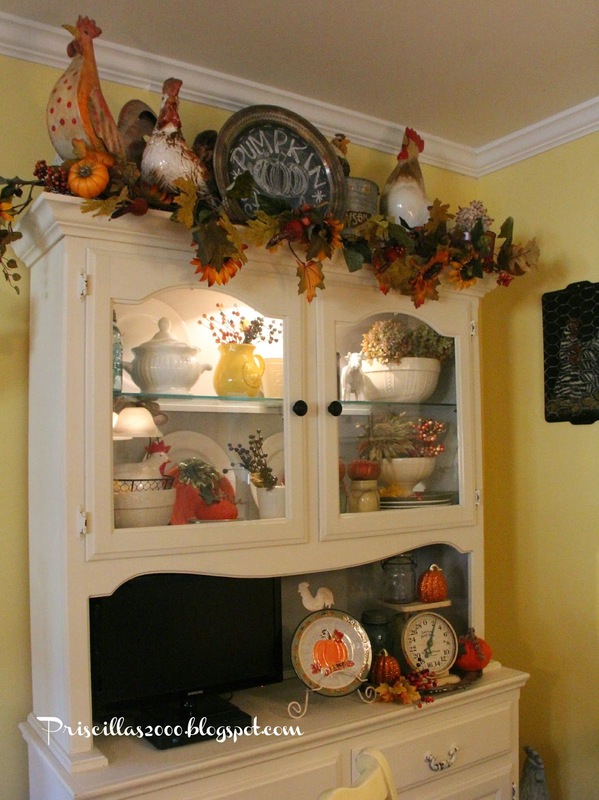 The chalk painted hutch holds pumpkin plates..fall leaves and berries and dried hydrangeas. 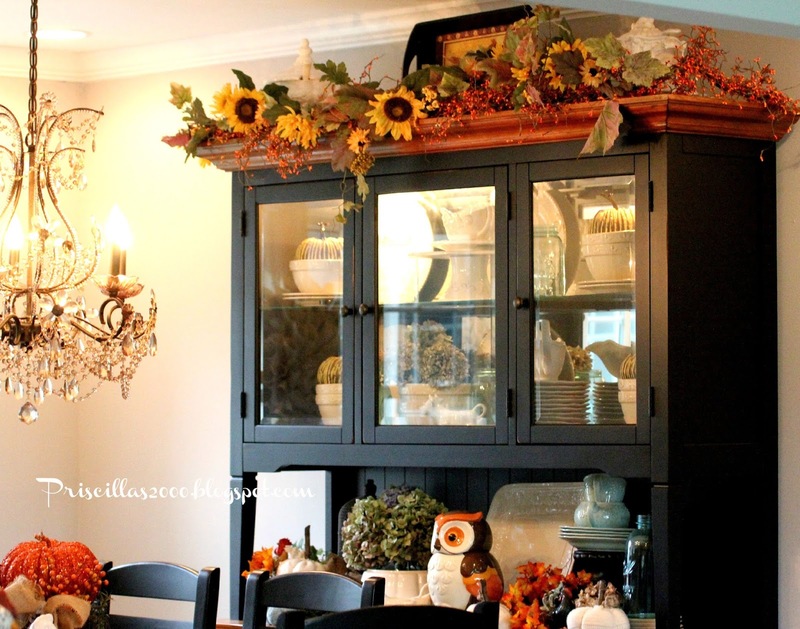 A fall garland and silver tray chalkboard surround the roosters on top.. The table has sweater pumpkins , fall sunflowers , a thrift store rooster soup tureen ..thrifted pedestal plates..and a glittery pumpkin. Love the owl cookie jar from BHG at Walmart ! fall leaf garlands and berry garlands. and lots of glitter pumpkins from Walmart again .. 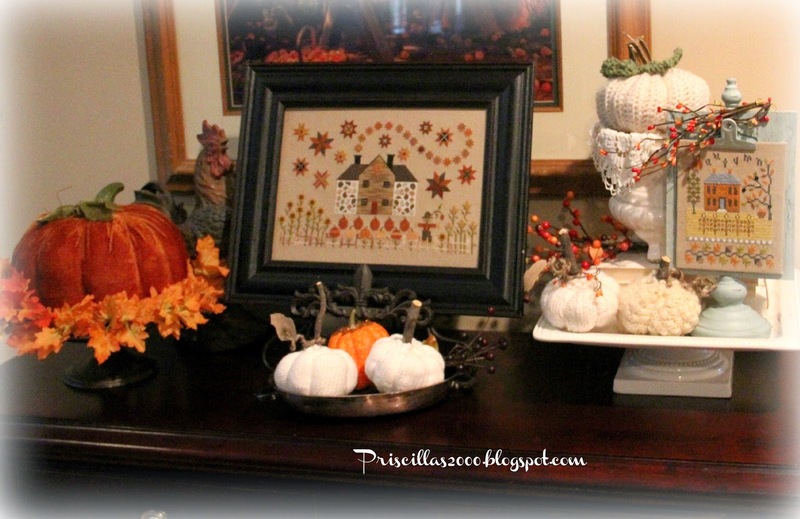 The family room has fall vignettes on the tables.. Love added vintage things with my cross stitch pieces. This buffet in the family is filled with vintage and thrifted goodies ! I finished Cinnamon Stars by Plum Street Samplers .. and I had this frame for my Lizzie Kate Christmas Alphabet so I just popped it out and put this one in ! Love it ! 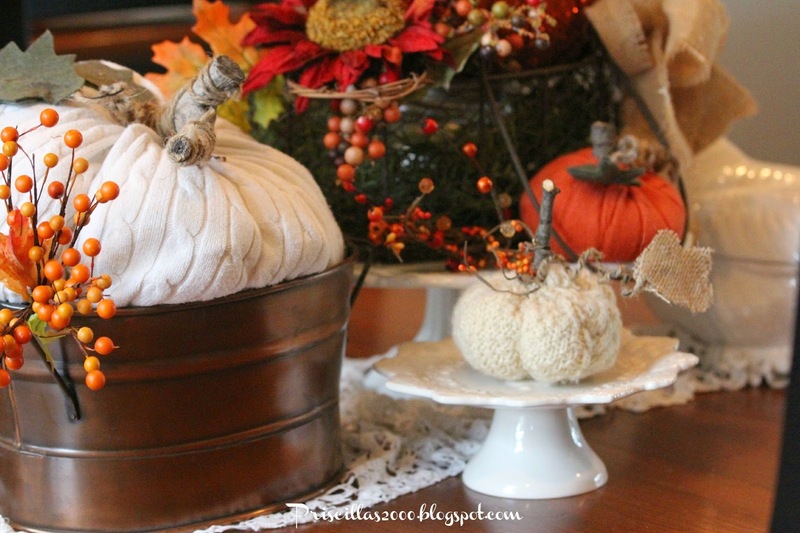 I surrounded the velvet pumpkin with fall leaves on a silver pedestal. 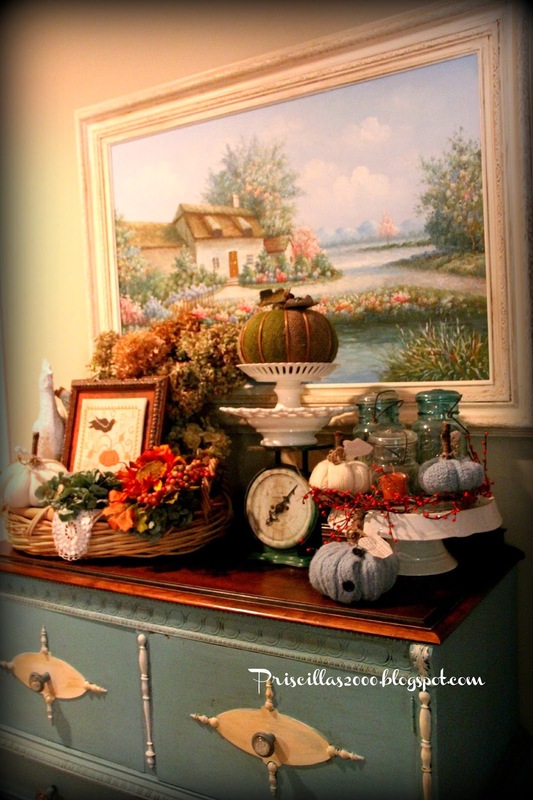 Well, thats it for the Fall tour ..I have loved decorating the house for this season .. These photos were both taken with my I phone ..Love the sun in the evening ! 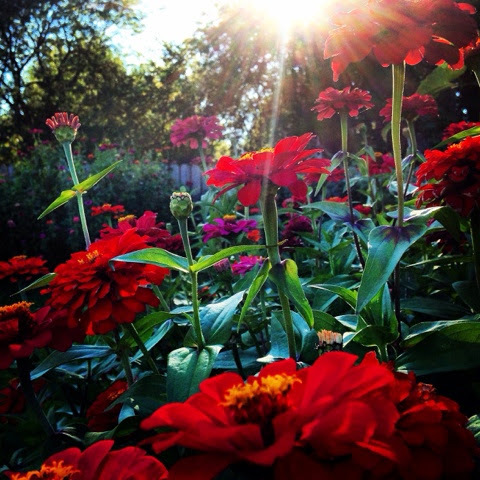 My zinnias are still growing strong ! So beautiful. I just love all those pumpkins around your home. Everything looks wonderful! Where in the world would you find all of those pumpkins? They look awesome surrounding your lovely home. Love all of your vignettes and your mantel looks so pretty. Your fall decorating is over the top. I love it all!! So many beautiful pumpkins and fall decor. Gorgeous Gorgeous!!! Your home is so amazing!! Thank you so much for the tour. My DH who is not a blogger even looked at it and was impressed!! Your home looks amazing!!! The colours of Fall are just beautiful, aren't they?? Your home is beautiful bathed in the Fall season!!! I love your cross stitch projects. Really makes me want to do it. But I resist, so that I can spend my free time doing crochet and quilting. Your porch looks awesome! Love all of your Fall in and outside the house Priscilla! Priscilla, everything is beautiful, both inside and out.. I know you put your heart and many talents into your décor.. Enjoy your Fall décor, before long it will be time for snowmen and Santa to appear..
Oh Priscilla I loved touring your home. The instagram pictures don't do it justice. It looks so gorgeous. 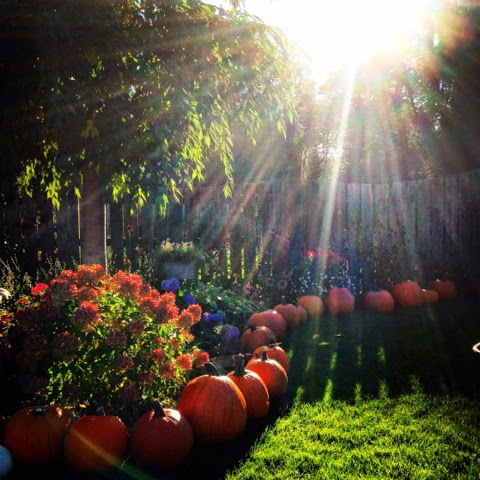 You have inspired me to add a few more pumpkins to my outdoor décor no as many as you have but a few more:) Thanks for sharing! I am in sheer awe! 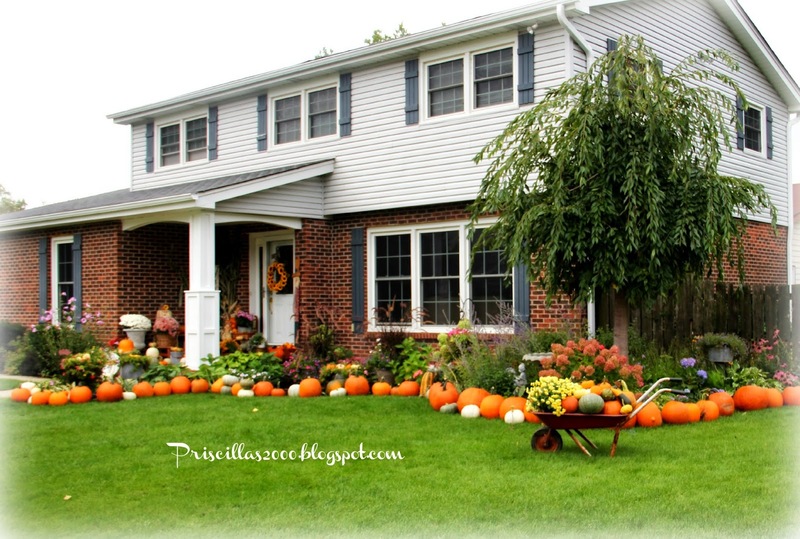 Your house is gorgeous inside and out, and I absolutely LOVE all the pumpkins! I wish there was a better photo of the Pumpkin Picking Day chalkboard...super cute. 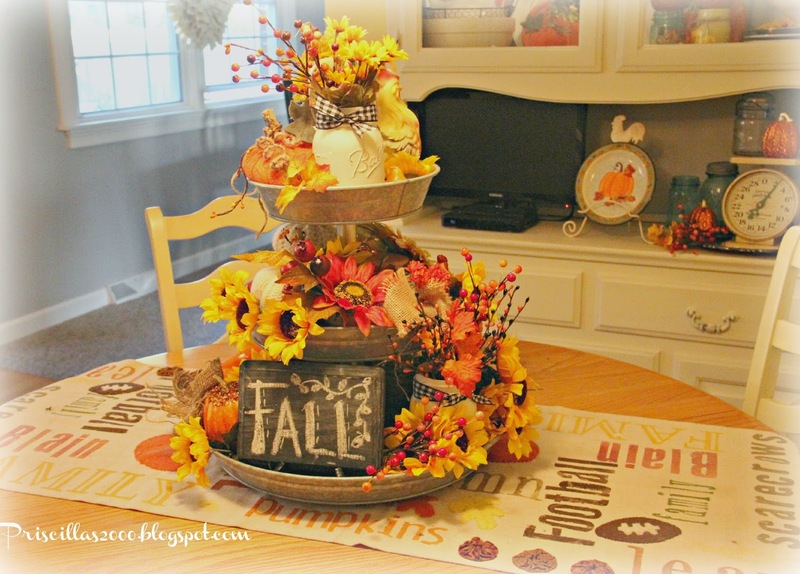 Priscilla, your Fall decor is always so gorgeous! I never tire of seeing it. The mixture of both new and old is delightful. 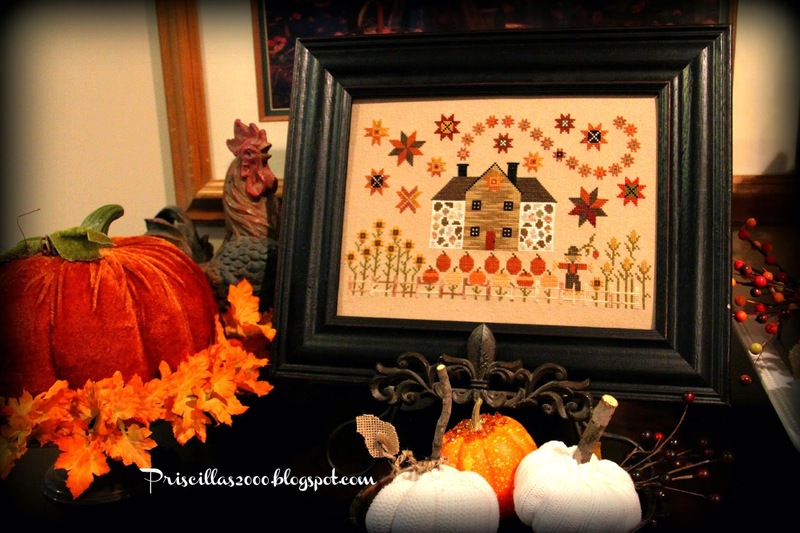 Your stitch work pieces are fabulous! Thanks for sharing your lovely home with SYC. 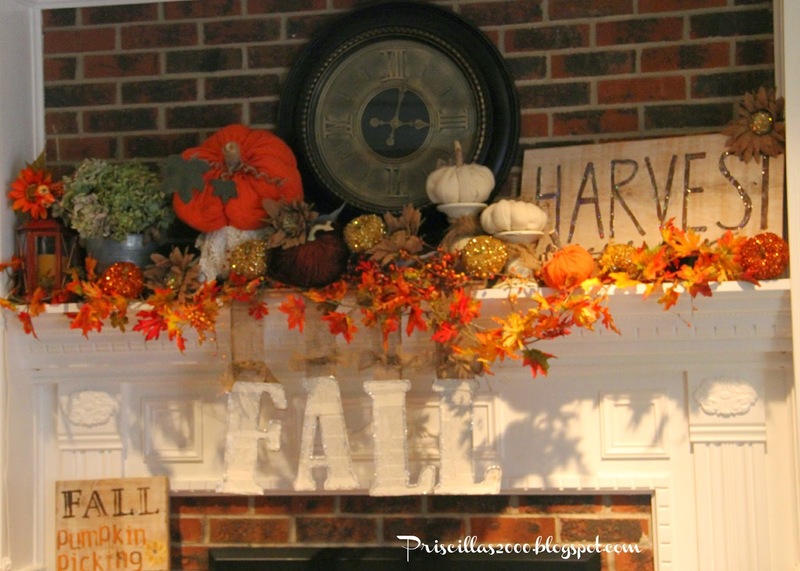 I find myself in the presence of "Fall decorating" genius! You have created a "Fall Fantasy" that is just wonderful! So many lovely vignettes I am going to refill my coffee cup and settle in to scrutinize them all. I think your post has more great photos than the last few magazines I skimmed through. 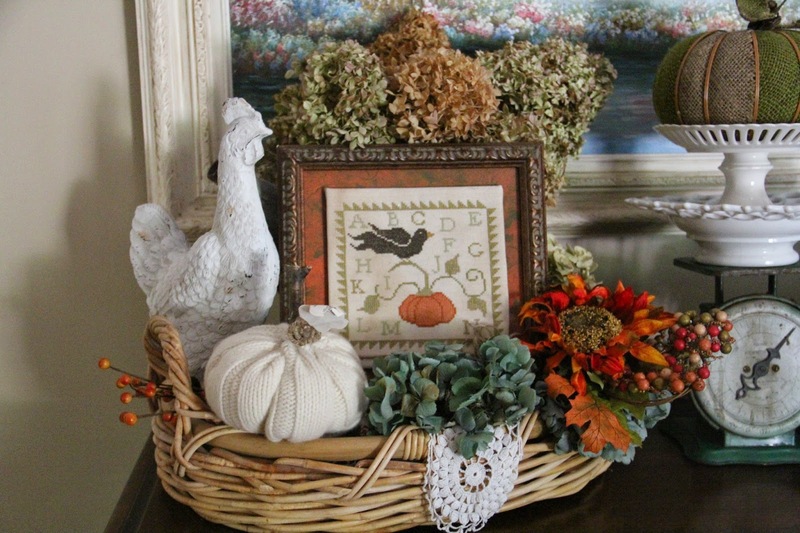 I love all the roosters and chickens and how you incorporated the needlework into your vignettes. I am crushing on your china cabinets. Beautiful - I love the fall colors and the roosters. 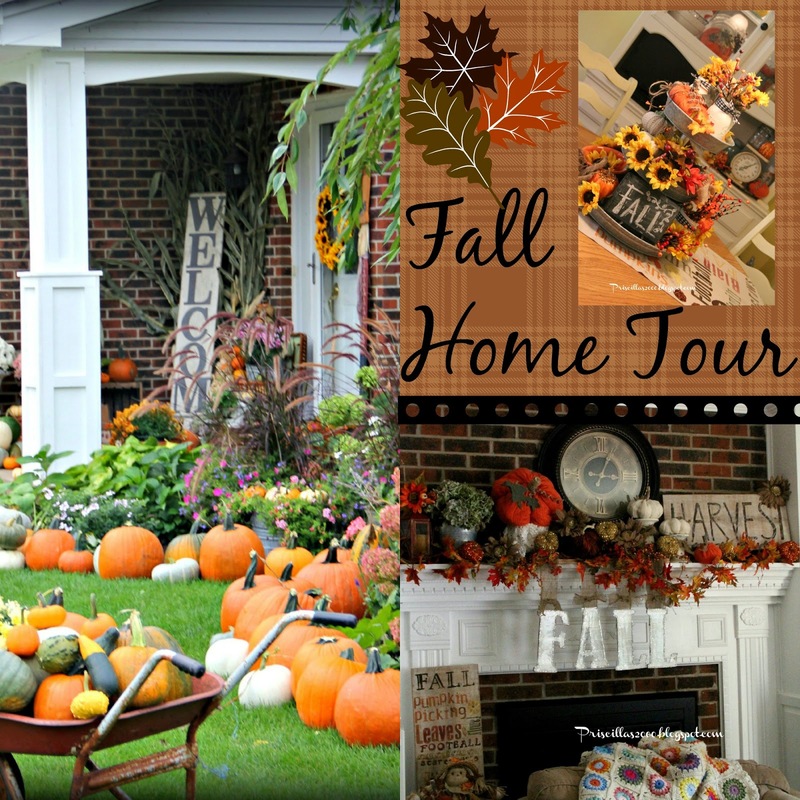 LOVED this TOUR of your BEAUTIFUL home all decked out for Fall!! Everything is so festive and lovely! !Looks fantastic, my friend!! We do love our Seasonal decorating , don't we? LOL! Thanks so much for stopping by and for brightening my day with your sweet comment!! Hi Priscilla, just hopping back to let you know that I will be featuring you at SYC this week. 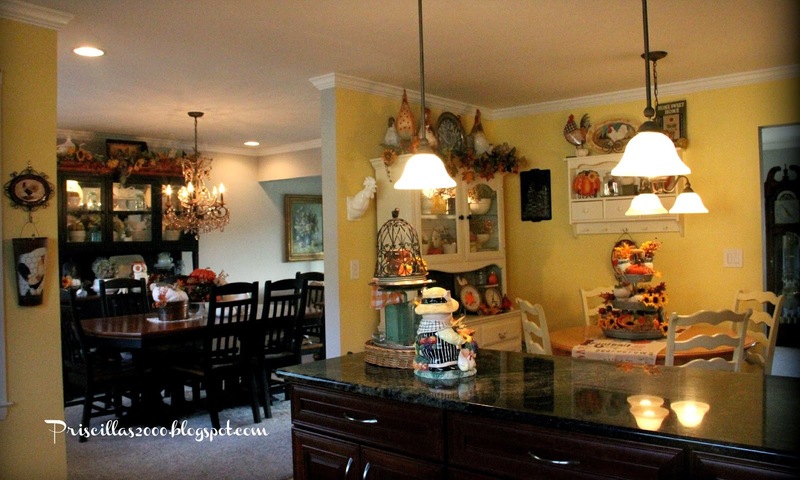 Your home is beautiful and I love all the fall touches you have added. Gorgeous!!! 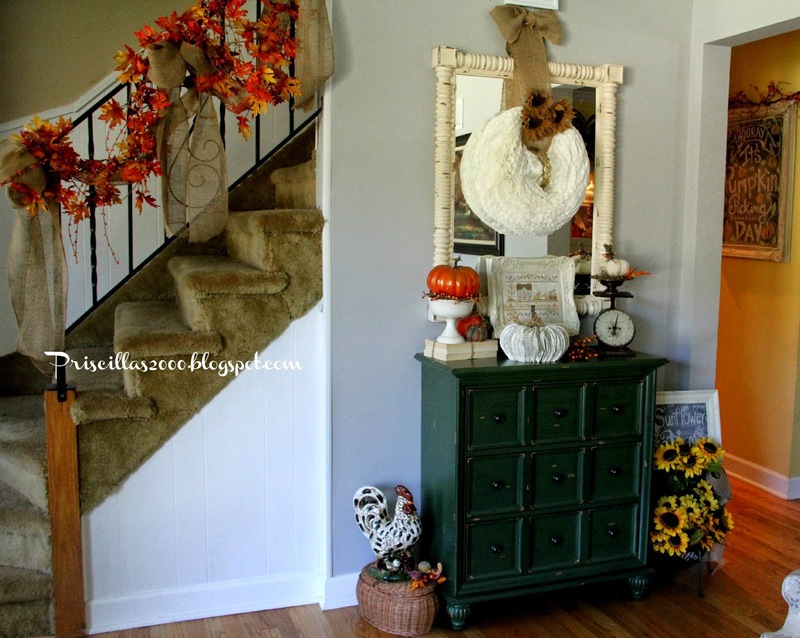 Your fall decor is just amazing! Every surface is bursting with the bounty of the season. Love how you used hand crafted, and vintage items as well. Beautifully decorated.... As always. 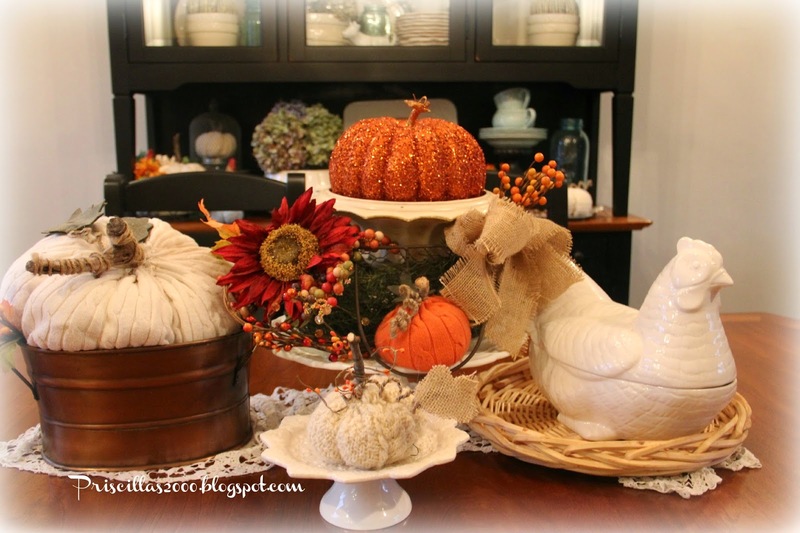 It seems as if your decor is a taste of rustic, French country, with a Tuscan flair...which seems the way my home Is going now....love your touches of fall...great inspiration!